ZESI supervise the demolition of existing ammonia feed pump system and day tank, and provided oversight on the installation of a new 36-inch surface water line and meter run. The project also included the installation of a new chlorinator and chlorine feed line as well as the communication system. ZESI has performed complete construction management services including management and inspection for the HCFCD on the South Service Center. The project included repairs to the wash bay and fuel island. The RS Means cost estimating program was used for this project. The construction cost estimate for this project is $1 million. ZESI performed complete construction management services and inspection for HCTRA on the Park Row Paving project. This project includes paving, signals, traffic control, SW3P, and underground utilities. ZESI used Suretrak for the scheduling and the Captract management system for HCTRA. This project involved close coordination with TxDOT, HCTRA, the City of Houston and their design consultant for the IH10 project. The construction cost estimate is $1.9 million. ZESI was a sub consultant for construction management services including inspection for the Kirkwood project. This project included paving and utility improvements. CIPMS was used for this project. for the San Jacinto River Authority. The role of ZESI is Document Control. ZESI is responsible for tracking and coordinating program documents including such things as submittals, requests for information, and field orders. In addition we are responsible for keeping track of all documents in logs that are kept up on a “live” basis and updated on SJRA’s electronic document control system (DSC), SharePoint. The DCS also aides in keeping up and distributing any drawings or specifications that come from the Engineers. 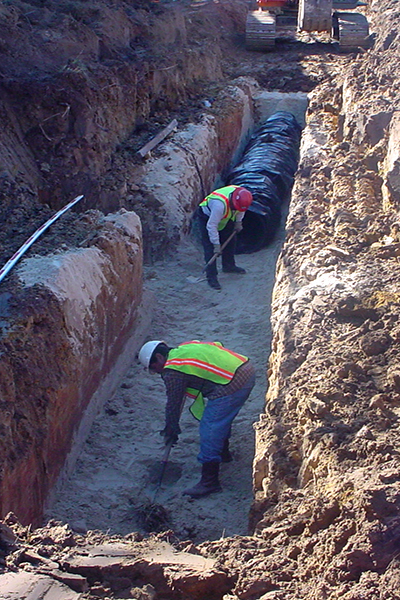 ZESI provided complete construction management services including management and inspection for the City of Houston on the Ridgecrest Waterline Replacement Project that included 35,000 feet of 8-inch waterline constructed with bore and jack techniques. The construction cost estimate for this project is $1.3 million.